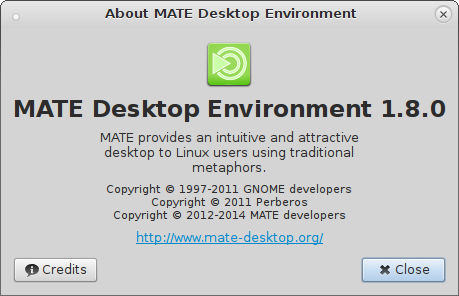 The team is proud to announce the release of MATE Desktop 1.8. We would like to thank every MATE contributor and user. As usual, we asked people from distributions that ship MATE what they think about our Desktop Environment. I forsee MATE being one of the most used desktop environments in Debian Jessie (and beyond). Some of our users express that they want to stay with GNOME 2; because they like how things used to be, they run older hardware or they want a more lightweight desktop. Given that GNOME 2 became unsupported and will eventually be removed from our meta distribution due to various maintenance, regression and security issues; MATE brings back all the glory with an active development team. Their continuation of GNOME 2’s development fixes outstanding issues, brings new and useful features and keeps the good old experience alive and kicking. MATE shared the same basic philosophies of Slackware, such as simplicity, stability, and no fixed release schedule. It will be released when it’s ready and preserving the same metaphor which is proven to be working well. MATE is also easy to be maintained and integrated on top of Slackware since Patrick Volkerding has given a solid foundation as the base layer in which MATE could fill the need of GNOME-based Desktop Environment which Slackware lack of since 2005. I’m looking forward for the evolutionary changes that MATE developers will integrate for the next major release of MATE. MATE is a great desktop environment for those who like the old GNOME 2 experience. I greatly appreciate all the hard work that is put into MATE to keep it stable and mature yet at the same time incorporating new bits where appropriate. The effort to keep MATE agnostic in terms of the user’s operating system or distribution is also to be applauded. I enjoy being a part of the MATE SlackBuilds project, which aims to bring the MATE desktop to the Slackware Linux community. Thanks to the entire MATE team! The openSUSE team wants to thank the MATE developers for their efforts in providing this new version and is proud to announce the availability of gnome-main-menu, which will please users attracted by a traditional and easy to use desktop. It’s a pleasure for us to work with the MATE team and we want to send them our congratulations. MATE proudly carries the colors of GNOME 2 and continues where the project left off. In many ways and for many people MATE just feels like home. It’s simple, stable and full featured. While more recent desktops experiment with new concepts, MATE provides an environment which works exactly as you’d expect it. It’s popular with our users and it’s the desktop on top of which Linux Mint built its technology and identity since 2006. We’re very proud and very happy to support MATE and delighted with each and every new release. During the Fedora 15/16 releases I was very dissatisfied with the desktop solutions on offer. After 10 months of using XFCE I discovered MATE and decided to build my own desktop for Fedora in December 2011. This work resulted in the first external MATE Desktop repository for Fedora and was used by many users worldwide, including Fedora spins based on my packages in Russia, Latvia and Indonesia. The corollary to this work was to bring the MATE Desktop inside official Fedora together with Dan Mashal for Fedora 18. Two releases later we have a stable and usable MATE 1.6 desktop solution in Fedora 20. MATE 1.8 is currently in Fedora rawhide and will be released with Fedora 21 in the summer of 2014. MATE was originally created by an Arch Linux user and I am delighted that MATE is now available in the official Arch Linux and Arch Linux ARM package repositories. MATE provides a complete, fully integrated, responsive traditional desktop experience and consistent work flow on my Raspberry Pi, CuBox Pro, laptop and desktop. Brilliant! MATE 1.8 is the result of 11 months of intense development and contains 1845 contributions by 57 people, and more than 291 translators.